After a few days in a place where time seems to stand still, I find myself forgetting what day we arrived here. That may be a sign that we have finally started to feel comfortable here in Zambezi. We are outsiders — every searching stare, every joyous laugh as we mispronounce a name, every hand outstretched just to touch us — reminds us of just how differently we are viewed here than in America. Yet, through all the differences, we have carved our niche here. We adjust to a new normal, displaying skills of resilience and adaptation that make many of us feel more free than we ever could have imagined. 6. You don’t know a true welcome until you have experienced a Zambian welcome. Probably the most common phrases here are “You are welcome here,” “Welcome to Zambezi,” and “Feel at home.” Perhaps my favorite phrase the Zambians use is “Feel free.” In America, we love to say that phrase too, but we complicate it by saying “feel free” to do something specific: “Feel free to grab a cookie” or “Feel free to look around.” In Zambia, you can just feel free — without specifications or caveats. Everything is simpler here, and even the language reflects it. 5. Not only does the “feel free” attitude apply to lifestyle, but it applies to material goods as well. Today, when some of us went to the market, we came back home with free gifts of a watermelon and a stick of sugarcane so long I could have pole vaulted with it. Our host family offered nearly a whole chicken, a whole fish, nshima and much more for us when we stayed with him, and his whole family waited to eat until after we had gone to bed. Mark, my fellow Zag who stayed in a very simple home far from town, told us about how his family told him they couldn’t even afford Coke — and followed up the comment by offering each one of their Zag guests a Coke for breakfast. 4. The degree of esteem that most of the people in Zambezi gives us is both a blessing and curse. Whether that respect comes from the relationships Josh and past Zags have built here, or whether that comes from the fact that chindeles (western/white people) stand in such stark contrast to the Zambezi community, it forces us to be wary of our actions in a way many of us have never experienced before. No Gonzaga Study Abroad presentation can prepare us for the number of eyes that will be on us during almost every moment. That can be seen as pressure, but I prefer to see it as a challenge to rise to the occasion and be a person whose actions are worthy of such respect. 3. Patience is key. With almost every name you learn here, you have to ask each person two or more times how to pronounce it. You must wait quite a while for people to show up for classes, since we’re on laid-back “Zambia time.” Most importantly, you have to be willing to field question after question. During our homestay, our host was shy to the point that the word “shy” doesn’t quite do him justice. Yet he answered every single one of the thousands of questions we asked him. It’s our challenge to model that attitude, since our mission here is a combined one of teaching and learning. We must be willing to foster an atmosphere of learning that encourages questions and doesn’t downplay them as annoyances. 2. This isn’t the first time we’ve noted this on the blog, but the number of children here is astounding. Mama Bessie, the superintendent of the schools in Zambezi, told us tonight that there are 20,000 children in the 110 schools in the area. As Josh discussed during our reflection last night, we must be intentional about seeing kids as more than a backdrop — as more than just an overwhelming presence waiting to swarm us whenever we venture outside the convent gates. We must see them as individuals with their own stories. As a teacher at Chilenga Basic School, I must be intentional to see children as they truly are — beings of infinite worth and potential whose care I am entrusted with during the hours I am welcomed to teach. 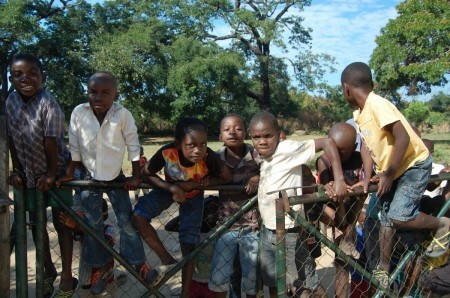 I also feel a challenge to be especially kind in my interactions with young Zambian girls. As Mama Bessie pointed out tonight, there may be 20 percent of Zambian men who treat their wives with respect. She believes the rest treat women more like house slaves. They believe that the women’s place is in the kitchen and force their wives to cook and clean for them, even when some of the men lie around drunk all day. The power structure is very male-oriented here, but if we treat a young Zambian girl with respect, maybe she will be less willing to put up with a man who treats her like a slave when she’s older. That is my hope and my desperate prayer. 1. At the end of the day, we learn to adapt to life here. My left big toe is inflamed and infected, and I have come to terms with the fact that I need to soak it in hot saltwater every night. When the shower water comes out as a trickling stream of 45 degree water, you learn to nut up, strip down and get yourself clean. I didn’t go a day without my protein bars this entire semester, but I’ve already gone three full days without one — and thanks to some divine providence, I’m doing just fine. I also stand here as a witness that two grown college boys can fit into a twin bed (thanks to Chris for putting up with me during the homestay), and that when you take college students away from their cell phones, the world does not implode. In fact, life off the grid just might be a more pure and engaging experience. Josh breaking out his dance moves — including a funky adaptation of the running man — and an ant crawling across this computer’s keyboard might be signs that it’s time to sign off. Okay, I was thinking you all might be getting tired of reading comments from “Katie McCann” every morning so I told myself to restrain from posting on the next one. Then I saw it was written by Matt…and then I read it. Impossible not to comment. And jeeze is there so much to say! Matt, I am in absolute awe. You are incredible, and your writing is incredible. I could not have captured Zambezi any better myself. I loved what you had to say about feeling free, especially your quote that “In Zambia, you can just feel free -without specifications or caveats.” SO. TRUE. It is such a new, liberating and raw feeling. Relish in it Matt. Embrace every second of that feeling. Mark, I struggled a lot with how willing the people of Zambezi were to GIVE when they had so little. Their unconditional generosity can almost feel like a burden when we are already so privileged. But I know you, and I know that you excel at practicing gratitude and being intentional with the relationships you build. Continue to do these things and remind yourself that although its uncommon in America, this behavior is enough of a “Thank you” for their generosity. Hi to Conner, Cecilia, Josh, Suzan, and Mama Kawatu!! I’m not kidding when I say I think about you ALL. THE. TIME. Conner, I hope you’ve already made at least one batch of no-bakes. And if you haven’t, this is an order. Also, Mark I’m sorry to do this but Game of Thrones was so freakin’ good last night. AH SO GOOD. My name’s Brittney and I went to Zambezi two summers ago. The first thing I said when I finished reading this is who the bleep is this kid and why don’t know him? Your writing is as engaging as your curious mind is. The perceptiveness that you’ve shown while exploring Zambia’s complex issues gives me hope that someday all kids will think as consciously and critically as you do. Keep asking questions, even if you don’t get answers. I’ll leave you guys with some words I saw yesterday. As a graduating senior, this little nugget of wisdom brought me a sense of peace and contentment, and I think it’ll be useful for all you sitting around that long wooden table, too. Ready? My Bob Marley chitenge (along with my J.A.S. posters, Josh) is the one thing left hanging in my packed up room in the Logan. I still haven’t been able to fully solve the mystery of what my time in Zambia means to me yet (and Senator Lisa said it’ll probably mean something different to us every five years), but I know I’ll have a lot of trouble taking the tacks out of that chitenge. Y’all are very lucky. Know that. What a gifted writer you are, Matt! It’s so great to hear of the deep life lessons you and the other ZAGS are learning and experiencing in Zambezi. Keep up the great work, zest for learning, teachings, patience and astute attitude! I’m simply in awe of your daily reflections. Conner- Chad caught “Walter” during the annual fishing trip! It was a huge small mouth bass. The “guys” all had a good time. You were obviously missed and talked about around the fire. Love you loads- Mom, Dad and Chad. Matt reading your reflection as I end another day in our American lives, I realize how people like yourself and your fellow zag fams can make such a difference in so many lives by being where you all are. Your post was remarkable. I think it is easy to take the things we hear and see on ( wait for it Conner) CNN for granted and say things like “oh that’s terrible for those people” and feel compassion at the time, then 5 minutes later resume focusing on our own “problems”. It doesn’t mean we don’t care,unfortunately it seems that’s the way it is. Gonzaga zambezi 2014 travelers may you all sleep a little easier tonight and every night knowing that you all did something to help change someone’s life. Your article is remarkable. I know you are a sports writer for the Gonzaga Bulletin, but your innate observations about Zambia culture, such as treating the little girls with a little extra kindness and respect, shine light on your deeper talent for writing but more importantly the intentional, honest, and true man you are. Thanks for sharing your stories all of you. They are vivid, thoughtful, and raw, which make them excellent. The digital divide, as well as the ‘divide’ in so many other ways between “us” and “them” seem so vast as I am sitting in a hotel room in Taos, New Mexico with wifi and a laptop. Your story reminds me how crucial it is to remember the rest of the world. I know that I get caught up in life, obligations, activities, etc. here, but all y’alls stories give me new thoughts to contemplate and vivid awareness of the poverty, as well as the beauty and thoughtfulness, that is currently happening in these rural, far away places that many people cannot begin to imagine. Thank you. Also, a note on “Zambian Time,” that just sounds great! It must be hard to get used to after so much of our time-oriented society in the United States. I believe that its well-worth it and truly gives opportunity to be present in the moment with all around. A warm hug and hello to Lili, Carolyn, Chris, Josh, Savannah, Hannah, Paxton, Connor, Matt and the rest of you amazing Zags that I hope to have the chance to get to know. P.s. Can someone tell Graham and Moses hello for me?? Thanks!! Being your mom first and foremost, I have two things to say: I am so proud of you! and IS YOUR INFECTED TOE OKAY??? Okay, I feel better. I feel like it might have been tough having to write your blog post on the heels of the hilarious meat stick blog (I’m glad you were with those girls so you could defend them against the monster rodents), but your post was perfect. Your writing transported me right back to Africa and to the beauty of the children and the way of life there — and how important it is to get a time to spend time away from the busy (but also wonderful) lives we have here. I hope you are surviving without your Builder Bars (I hear there is lots of protein in fish eyeballs) and goldfish crackers. It was good to hear your voice through the blog. We miss you so much! Our trip to South Africa was the best ever — can’t wait to tell you all about it. We are praying for all of you — enjoy the adventure! XOXOXO Mom and Dad. P.S. Tulo, the Princess, is killing it. The Rockies are doing great – by the time you get home they will probably be in last place. Also, Dad told me this morning that some basketball player from USC just transferred to Gonzaga to play an extra year. Go Zags! We love you! Wow! Your stories were so captivating! I can tell that your time in Africa has already given you life changing experiences. Everything you’ve described from the gifts of cherished coke and chicken to sharing a twin bed with Chris has given us a perfect glimpse of Zambian life. I can’t imagine what the team sees walking in the village, but now through reading your post, I can visualize it a little better. I didn’t know that “feel free” in Zambia was the “no worries man” in Jamaica. Thank you for writing such a engageing and raw post! Your natural talent and creative skill really shows through. Question: How did your toe get hurt? Question: what kind of food are you guys eating there? Question: what are the morning runs like? Is it really hot? I’m so happy that all of you guys seem to really soaking up everything Zambia has to offer. The good and the bad. My love to Han, Lili, Paxton, Savannah, Chris, Connor, Mark, Josh, and the rest of the wonderful Zambia family out there! Cecilia, you look radiant in all of the photos and I am counting down the days until I get to see you again!! Matty J! You are such a wonderful writer and thoughtful human being. Everyone above has already said everything I could say about how awesome your writing is. I’m just so proud of everything you’re learning and the incredibly eloquent way you express what you’ve learned. Put some neosporin on your toe, ya dingus! Can’t wait to hang out with you when you get back and hear even more of your stories. Love you lots! How perfectly you have captured Zambia in these few short points! It can be so easy to become overwhelmed by the people, and the love, and the swarming amounts of children, so the fact that in a few short days you have made these realizations is astounding! Beautifully written! Hello to all my friends and/or former ressies siting at the tables right now! Enjoy Zambezi, there is nothing quite like it in this world. Soak up every minute of technology free interaction, it’s unlikely you will experience it again. Go watch a sunset for me over the river, and LIVE IT UP! Hi Zags! Matt your post was beautifully written and instantly brought me back to my time in Zambia. What an incredible experience for you all. Continue to soak up every moment! Sending my love to Stephanie! I’m so happy that you are on this adventure of a lifetime! Wonderful truths coming from Matt. Gma J says that at our age we probably will never get to Africa, but reading your post and those of your Zambian Zamily is the next best thing to being there. They again prove to her that people everywhere are more alike than different. We weren’t sure what it meant when you chose to be a Zag, but after reading the comments we know all of you made an excellent choice to attend a college that gave you an experience such as this and an opportunity to develop your writing and people skills. We are overwhelmed with your writing and in awe of the compassion for others that grows in that grandson of ours. But, Matt, I do have one comment to make. I sure hope that you didn’t give Chris as much noise about sharing a twin bed as you gave me about sharing a double bed in Boston.